I want to summarize the issues of the current Community web interface that prevent me to use it in the efficient way. All below issues were already reported and discussed number of times but after 7 months of the new Community I don’t see significant progress. A few words about my Community usage profile. I am answering questions for the number of tags including SAP BusinessObjects Planning and Consolidation, version for SAP NetWeaver; EPM Add-In for Excel and some other (1122 answers for the new Community on 19.05.2017 and a lot of comments). I have also written some blogs and I am searching for the information on the Community pages. In order to answer I need a list of questions for the tags I am interested in. Unfortunately, currently it’s not possible to have multiple tag questions on the same page. I have to open multiple tags in multiple tabs of my browser and constantly switch between tabs. It was not an issue in the old SCN when 99% of questions I was interested in were in a single Space. Today we have much more tags then spaces in old SCN. When answering I have to play with answer/comment approach resulting in a very unclear discussion structure (like topic author providing answer instead of comment, etc.). I prefer generic “Reply” instead of answer/comment. The ability to sort replies by timestamp is also required. There are also issues with the number of levels of comments (comment in reply to comment). After some level you have to press “Show More” button to view extra comments. And after some level you are not able to reply to the last comment at all. Number of levels has to be increased to support real life discussion. Starting from some Community engine update the comments are collapsed by default. As a result, I have to spend time to expand comments. The option to expand/collapse comments has to be configurable in the user profile. When posting answer/comment using Firefox ESR 52 I often copy/paste some words from question text. And paste results in the insert of carriage return before and after pasted text. I have to manually delete mentioned carriage returns. I don’t have this issue on any other site. With Firefox ESR 52 I am unable to paste pictures directly in the question/answer (Ctrl V). I have to save picture in some local folder and then upload it to the Community Web site. I don’t have this issue on any other site. And the same issue is confirmed for Chrome, IE and Safari. Sometimes my comments can be deleted by the question author if I am replying on his reply and he delete his reply. The general rule has to be: if there is a reply after some post then this post can’t be deleted even by the author. Notifications on the Web page or by e-mail are partly useless for me. I am receiving notification only for direct reply, not for any new content posted under question I am answering. I have to refresh tag pages to see if somebody added some posts. I am using P-ID to participate in the Community due to changing S-ID. The result is that I am unable to browse notes or view protected help resources in the same browser with S-ID. I have to use different browser (IE) to work with S-ID and copy paste links between browsers. Q&A: What is the reason behind having Comments and Answers? Q&A: What to do about the comment/answer distinction? No comment levels at all! Q&A: [BUG] Urgent! No “reply” button on comments with the new design! Idea Place: Paste pictures from Clipboard (STRG +V) into Blogs etc. 7 Disable delete for post with reply Q&A: Deleting answer after comment. 8 Notification for all new posts under the question with my answer/comment Q&A: Notifications: incomplete! I will update this blog when issues will be solved. P.S. In the comments column I have added links to the Q&A, Idea Place and other discussions with similar ideas. Update on 12.10.2017 Comments levels issue solved! Update on 08.10.2018 With new Community design – no comments levels at all (from 27.09.2018)! Well written and a good list of items which need to be addressed. I think many of them are listed in Idea Place, which, after a long hiatus, looks like it is being used for the purpose intended. Have you looked over which ones correlate to your items listed here? Reply, instead of having to choose between Answer and Comment, seems to have been resurrected as a proposal. I asked for this some months ago, but the general consensus was against changing. Quite possible it will be reviewed again in light of yours and other comments. Maybe the developers or project admins will reach out to you as a User representing what I consider to be the second greatest issue facing the community (loss of subject matter experts providing solutions). I think you would be a fine representative of those interests as fixes are developed. Thank you for taking the time and effort to identify the issues that you face in trying to interact with the new community structure. For sure all of the mentioned issues are represented in the Idea Place and in Using SAP.com (and many other). I will put later links in the Comment column. But I am writing this blog to concentrate on the issues I am facing every day answering questions. It’s all good Vadim! I understand and agree with your focus. the result list is not very nicely represented – you will probably end up styling it to make it useful. In my example this should be the collection of all questions for SD Sales and Distribution, SD Sales and SD Billing. You need to replace them with the tags, in which you wish to participate in. I cannot say whether the list is accurate, because I do not use this option. There is also a possibility, that the implementation team decides at some point to change the sorting option or hard-code it. I was astonished, when I saw today, that Jürgen’s idea was set to ‘delivered’. My interpretation in this case is, that we are not getting an optional flat view of all replies sorted by time-stamp. The only possible way, that I can see this possible, is a Greasemonkey script. The same is valid also for the idea about configurable expanding/collapsing of comments. I completely agree with all points which you raised. What I want to have is the list of questions like https://answers.sap.com/tags/01200615320800001016 but with multiple tags selected for it. I am in the process of compiling ideas and issues in a master list where I can provide status updates. Your diligence will help ensure that I don’t overlook any. To set expectations: There are hundreds of ideas and bug reports to compile. So it might be several weeks before I have everything. But I hope to start sharing some of it in the coming weeks, building on and maintaining it in the months to come. I hope you remember the initial work that we were doing around item No. 8 that you listed here. Thank you for consolidating your feedback btw. But I can quickly update you that even though the work in that place was paused for a while due to developments being made to other parts of the community (such as mega-menu work for sapphire, browse the community, email notifications, etc. ), we have given this work now top priority for our next road-map. Your feedback and functionalities offered by the previous communication inbox (including exclusive updates on new comments and answers where you have participated) will be our goals for that work. I will share more details as they become available. We’ve responded to both of these in Idea Place and the status remains the same. The question/debate around comments versus answers concept is up in the air for quite a while. It was decided to leave the situation as is as as we needed to focus our development resources on other higher priority topics (e.g. navigation). I will however forward this feedback together with the ideas regarding: 1. Sorting by timestamps (flat display, right?) 2. 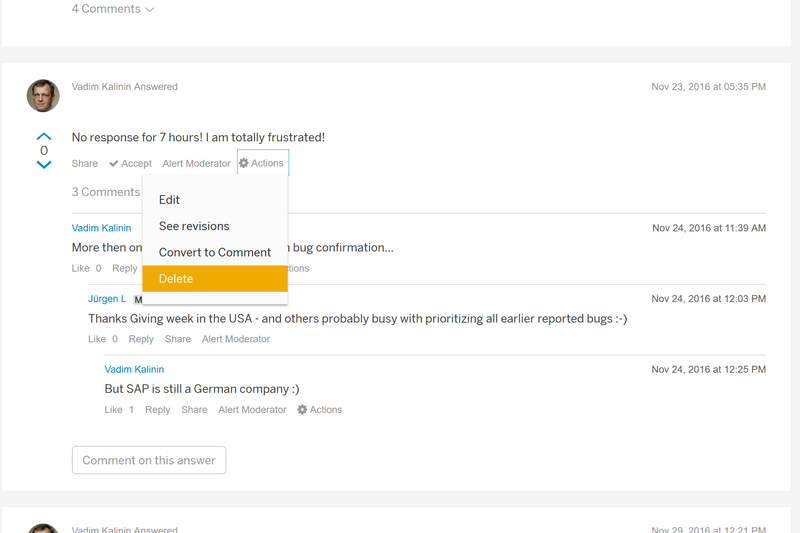 UI suggestions to better to distinct between Comments and Answers, to the relevant team members. Are you referring to the issue where the current limitation on number of replies to a comment isn’t sufficient to allow free discussion? You mean that each user will have the option to decide for himself if he wants to see comments expanded or collapsed? 2. After 8 months of the new Community it’s clear that users do not see the difference between answers and comments. May be it’s the time to accept it? 3. Yes, number of reply levels is too small. 4. Yes, I want to have comments always expanded (to save my time for expanding). And I want to set it in my profile. Others may prefer collapsed view. 5-6. I am trying to explain here that it’s a VERY annoying bug for me and I spend a lot of time deleting extra carriage returns and saving pictures as files. It is far from perfect, because you would not be able to collapse the comments, and it cannot expand the comments, hidden under show more comments link, but if you don’t encounter this situation very often, it might be useful. 7. Just tested – same bug present! And the answer is successfully deleted! Thanks, I will re-open the bug ticket. Nothing has really changed here. It’s a high-priority issue that is also very complicated, and work continues behind the scenes. It is now 8 days until the one year anniversary of Go-Live. Did anything get fixed yet? Not much choice in that, is there? #1: List of questions for multiple tags on one page (AND-Filter for followed tags) – Will be addressed with the new redesign. Where can I set a default view for expand/collapse comments? I don’t see an option in my profile! Not delivered. I am still able to delete answer with comment. Not delivered. As a result only #3 is delivered and may be #1 will be delivered if we are talking about the same scenario. Regarding #1 I can confirm that there will be a multi-select option for tags, as you describe in your example. Regarding #4: I’m sorry for the confusion. While the option to hide/collapse comments was delivered (I was referring to the examples you gave from ideaplace), you are correct that individual configuration of default settings for comment display is not delivered as it is not planned. Regarding #7: I want to clarify that a question cannot be deleted when it already has replies by other members. This has been delivered. When it comes to answers or comments with reply, I need to get back to the team. #1 Are we talking about Q&A question list? #4 – can you imagine my time spend on expanding comments? yes, #1 refers to all Q&A page, where you can filter for questions with the option to multi-select tags. #4: I’m with you. #7: will need to take this to IT again. #10 I’m happy to share that with the new redesign the menu will not be a flashing menu as you know it today. #11 As explained by Sebastian Wolf here, there are different opinions on this and that it was “agreed internally that it’s the best option for now to apply the same lifetime for all services for consistency reasons” It is not a bug, Vadim. #12 Also in the link you shared, I can see that there was confirmation in the discussion that the issue was resolved. My colleague Jerry wanted reassurance/feedback, but since he didn’t receive any response I assume this is not an issue anymore. I don’t think majority of community agrees with #11 being not a bug. Or happy with the explanation provided. I believe the #12 tracker issue has reared its ugly head at least 2 times in recent memory, but at present it is working fine. “#12 tracker issue” – it’s not only “tracker” issue. The site is slow in general, refresh result in long delays, especially list of notifications. Sometimes it takes 10-40 sec to wait for page load after clicking on some question. Please provide provision to Bookmark Blog posts. It was there in SCN and that feature is really handy and useful. September 2018 – no changes! End of September 2018 – comments hierarchy removed!